The white peaks of the Lyngen Alps have attracted the interest of climbers and mountaineers since the 19th Century. The Lyngen Alps are famous around the world for its excellent skiing and breathtaking landscape. 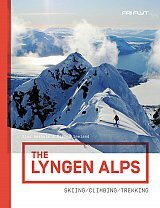 This guidebook is a comprehensive manual to the best skiing and alpine climbing in the Lyngen Alps. It covers the iconic Jiehkkevarri traverse, the easy option Perstinden, the steep couloirs of Jaegervasstinden and everything in between. Climbers get the key to the treasures of unknown Guhkkesgaisa and Piggtinden, the mountain made famous by philosopher Peter Wessel Zapffe. A good selection of ice-climbing routes is also described in the book. The summer visitor can enjoy the peaks, the valleys, the lakes and the glaciers of The Lyngen Trek, an eight day walk from south to north of the peninsula - or vice versa. A section of daytrips and family friendly activities are also included.